tuner in order to use its full potential. pattern an octave lower or higher. This helps you see the pattern drift easier. internal compensation for optimal viewing over a wide range of source pitch and volume. Once you or your customer like a temperament on a particular piano, you can store it for future use. 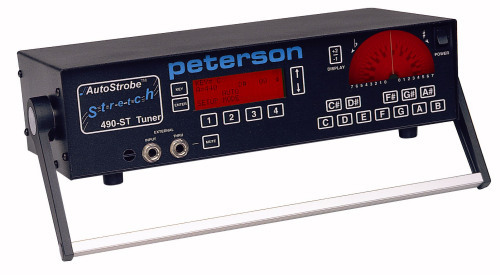 strobe patterns appear at the correct note for Bb, F, and Eb instruments. = Foot control option for changing note and octave manually. = EXTERNAL IUT AND THROUGH OUTPUT WITH MUTE - for in-line, silent tuning during performances. = An LCD screen displays all functions available and shows the modes you are using. = Selectable Electrical AC sources- 95-105 VAC; 210-230 VAC; 230-250 VAC; 50 or 60 cycles. Shipping, as usual, is actual cost drop shipped from our supplier to you. You must have Adobe Acrobat to read this manual.